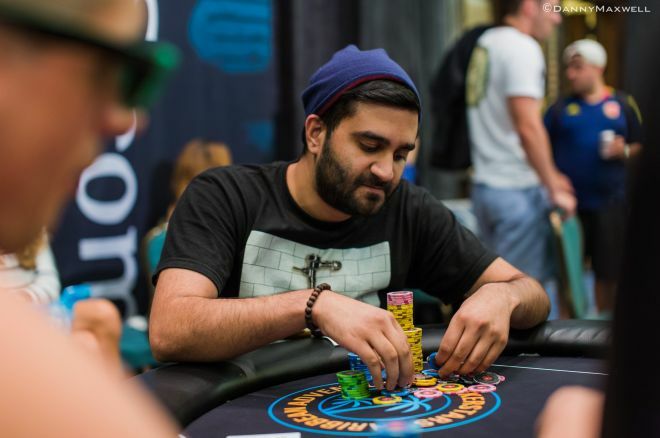 Day 1b of the 2014 PokerStars Caribbean Adventure Main Event drew 710 players, and in the end it was Shankar Pillai who came out on top with 173,900 chips. Right around 475 players remain with many notables still in the hunt. Among the many Team PokerStars players that entered today was SportStar Fatima Moreira de Melo. She was knocked out almost immediately, though. Moreira de Melo ran a full house into quads in a very unlucky turn of events. On the other hand, Vanessa Selbst, who finished third in the $100,000 Super High Roller just one day ago, made it to Day 2, and picked up aces today in a very interesting pot. Selbst closed out the day with 76,700 chips. Former PCA Main Event winner Harrison Gimbel had a nice start to the day as well after he got a hold of a lot of chips when his queens beat an opponent's ace-queen. However, Gimbel was knocked out at the very end of the day and that means he will not be winning a second PCA title. Kevin MacPhee, who made it to the Bahamas after some troublesome travel, arrived right in time for the Main Event. Unfortunately, his efforts were not rewarded as the former European Poker Tour Berlin champion was knocked out when he ran jacks into aces. Kyle Julius, runner-up in this event back in 2012, did not make it through to Day 2 as he was crippled by Dutchman Rens Feenstra and knocked out shortly afterwards. Feenstra moved all in on the river after a lot of action on previous streets and Julius called with the inferior hand. Feenstra’s top pair, top kicker took the pot down and he closed out the day with 148,400 chips. Matt Waxman called himself "terrible" after getting knocked out, holding two pair versus a flopped set, while Jason Lavallee saw his lucky beer get cursed. Lavallee, the EPT London High Roller winner, was knocked out in the final level of play when his tens did not hold up against ace-king. World Series of Poker bracelet winner Trevor Pope was also knocked out as he ran ace-king into Dan Kelly’s king-queen when the board brought a queen. Other players that were knocked out on the second starting flight included Team PokerStars Pros Juan Manuel Pastor, David Williams, Bertrand "ElkY" Grospellier, and Barry Greenstein. Scott Baumstein, Chris Oliver, Paul Volpe, and Michael Mizrachi also did not make it through, but there are plenty of great players still in the hunt for the title. Among the big stacks are Timothy Reilly (124,000), former WSOP Main Event champion Greg Merson (108,200), Dan Smith (71,200), and Fabian Quoss (65,800). The $10,000,000 guaranteed prize pool was met towards the end of Day 1b, and registration will remain open until the start of Day 2. Play resumes on Thursday at noon local time with a combined field of about 670 players. The levels tomorrow will be 75 minutes long and PokerNews.com will be right there with you to provide all the live updates, videos, photos, and chip counts. We'll see you then!